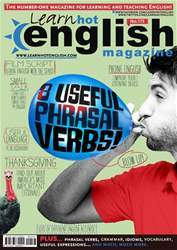 Digital Subscriptions > Learn Hot English > 173 > 8 USEFUL PHRASAL VERBS! Here are eight really useful phrasal verbs for you to use. Notice how they have more than just one meaning. 1. She gets up / along well with her team mates. 2. He gave to / up drinking a few months ago. 3. I was brought up / through by my uncle after my parents passed away. 4. I blew up / down the balloon and then hung it up. 5. She came up / across an old photo of her grandmother while she was in the attic.